HMS Hampshire was a Devonshire-class armoured cruiser of the Royal Navy. She was constructed at the Chatham Dockyard, Kent and commissioned in 1905 at a cost of �833,817. She served in the First World War and fought at the battle of Jutland on 31 May 1916. Immediately after the battle, she was directed to carry Lord Kitchener from Scapa Flow on a diplomatic mission to Russia. Sailing for Arkhangelsk in a gale she struck a mine at around 19:40 on 5 June 1916 off Mainland, Orkney between Brough of Birsay and Marwick Head. The ship sank very rapidly. Kitchener, his staff and most of the crew perished; only 12 men survived. The mine is believed to have been one of those laid by the submarine U-75 on 23 May. Fritz Joubert Duquesne, a Boer and German spy, claimed to have sabotaged and sunk Hampshire, killing Kitchener and most of the crew. According to German records, Duquesne assumed the identity of Russian Duke Boris Zakrevsky and joined Kitchener in Scotland. En route to Russia, Duquesne signaled a German U-boat to alert them that Kitchener’s ship was approaching. He then escaped on a raft just before Hampshire was destroyed. Duquesne was awarded the Iron Cross for this act. In the 1930s and 40s, he ran the famous Duquesne Spy Ring and was captured by the FBI along with 32 other Nazi agents in the largest espionage conviction in U.S. history. The wreck was designated as a controlled site under the Protection of Military Remains Act. She lies in around 65 metres of water off the north west coast of Orkney. 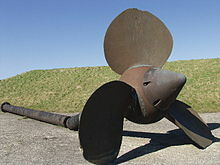 In 1983, one propeller and part of a drive shaft were illegally salvaged. The prop was later given to Lyness museum, Orkney after protests. Colledge, J. J.; Warlow, Ben (2006) . Ships of the Royal Navy: the complete record of all fighting ships of the Royal Navy (Rev. ed.). London: Chatham. ISBN 978-1-86176-281-8. OCLC 67375475.